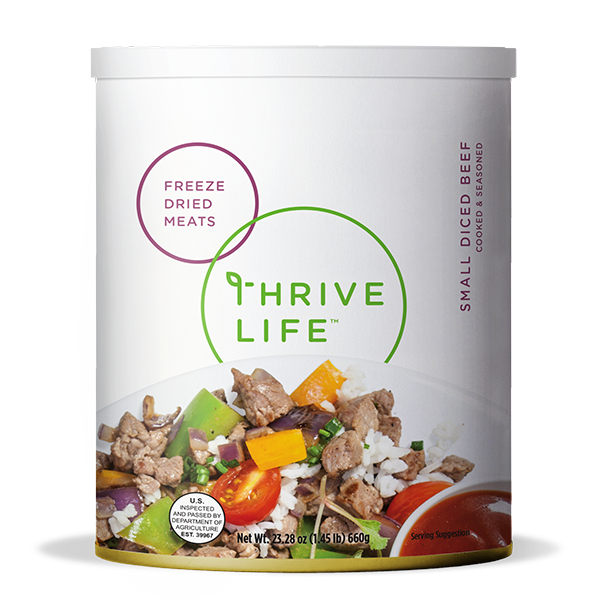 The cooked dices in Thrive Life Small Diced Beef will provide the hearty flavor you're after. They're excellent in vegetable stew and offer a quick solution on a busy day as part of a beef fajita. Add 1/2 cup warm water to 1 cup Small Diced Beef; cover and let sit for 10-15 minutes, or until tender. These dices are cut smaller than our regular Beef Dices but are more dense, similar to fresh roast beef. Use them in stew, or add a hearty punch to stir fry or Philly cheese steak sandwiches.